However, factors such as product offerings from large beverage manufacturers is preventing regional drinks such as kvass and coconut kefir to penetrate in the global fermented non-dairy non-alcoholic beverages market. Further, low awareness about fermented non-dairy non-alcoholic beverages among individuals in developing countries is also restraining the market’s growth. As per a report by Transparency Market Research (TMR), the global fermented non-dairy non-alcoholic beverages market is expected to be worth US$1,655.1 mn by the end of 2017. 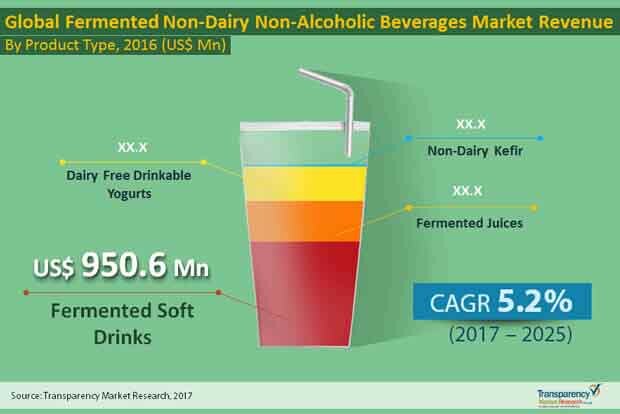 Expanding at 5.2% CAGR between 2017 and 2025, the global fermented non-dairy non-alcoholic beverages market is expected to be valued at US$2,483.8 mn by 2025-end. The report studies the global fermented non-dairy non-alcoholic beverages market based on a few parameters, viz. product type, sales channel, and region. The segmentation of the worldwide fermented non-dairy non-alcoholic beverages market by product type could include dairy free drinkable yogurts, fermented juices, fermented soft drinks, and non-dairy kefir. Of them, fermented soft drinks is estimated to hold 59.7% of market share in the global fermented non-dairy non-alcoholic beverages market by 2017-end. As per the sales channel classification, the market could be divided into modern trade, specialty stores, convenience stores, online retailers, and other retailing formats. Amongst all, the segment of specialty stores is anticipated to hold 25.7% of the market by the end of 2017. The global fermented non-dairy non-alcoholic beverages market is also studied on the basis of region in this report. North America, Latin America, Europe, Asia Pacific, and the Middle East and Africa have been considered as the key regional markets for fermented non-dairy non-alcoholic beverages across the world. Asia Pacific currently stands the leading regional market for fermented non-dairy non-alcoholic beverages market and is anticipated to lead the overall market in 2017. This is mainly because of high consumption of fermented soft drinks in China and other Asian countries. Vis-à-vis revenue, the region is anticipated to gain significant market share in the overall market by 2025 end. North America, among all, is expected to display the leading CAGR of 5.9% between 2017 and 2025. This is attributed to high per capita disposable income and considerably high spending on foods that are associated with health benefits. Furthermore, vast investments on R&D from companies that are based in North America is boding well for the growth of this regional market. The Middle East and Africa is a relatively new market for fermented non-dairy non-alcoholic beverages market. Leading players are seeking to enter countries in this region where fermented non-dairy beverages have low penetration. The presence of fewer key players and high cost of premium products account for the slow growth rate of this regional market. Thurella AG, Good Karma Foods Inc., Health-Ade Llc, FENTIMANS, KeVita Inc., Millennium Products Inc., Konings NV, and GT’S LIVING FOODS are the key companies that operate in the global fermented non-dairy non-alcoholic beverages market.